Source: Joe Simmer (Created by Michael Ledet and Chef Richard Stewart), Joe Simmer's Creole Slow Cookin' (New Orleans: 2 Martini Press, LLC, 2006), 84 - 85. 01. Rinse beans and place in a large saucepan. Add the water and bring pot to a boil. Then lower heat and simmer for 10 minutes. Remove from heat; cover pan and set aside. 02. Place the chopped onion and remaining Slow-Cooking ingredients in the slow-cooker. Pour over the beans and soaking water; stir to mix and cover. 03. Cook on Low setting for 7 hours (or High setting for 3.5-hours), or until beans are tender. 04. Remove about 1/4 cup of the beans from the cooker to a small bowl. Mash to a paste with the back of a spoon; stir back in along with all of the Finishing ingredients. 05. Cover and continue cooking on Low setting for 30 minutes more (or on High setting for 15 minutes). 06. Serve over the steamed rice. Use pkg labelled "dark red kidney beans" and not simply "red beans." 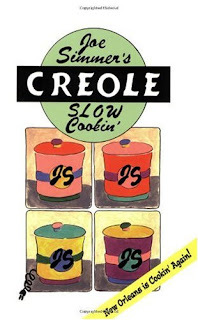 1 Source: Joe Simmer (Created by Michael Ledet and Chef Richard Stewart), Joe Simmer's Creole Slow Cookin' (New Orleans: 2 Martini Press, LLC, 2006), 84 - 85.